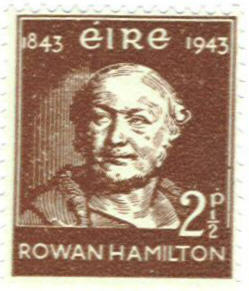 William Rowan Hamilton was the greatest Irish mathematician and one of the initiators of abstract algebra. He was a very precocious child in both mathematics and languages; he could read Greek, Hebrew and Latin at the age of five. He was educated at Trinity College, Dublin, and while still an undergraduate was appointed Royal Astronomer of Ireland and Professor of Astronomy. For years he attempted to define an operation on 3-space that represented rigid motions; his goal was to generalize the way that the operations of the complex numbers so represent rigid motions in the plane. One day in 1843 while walking across the Brougham Street Bridge in Dublin he realized that he could do so if he added a fourth scalar dimension and abandoned commutativity; the resulting quaternions lost out to vector analysis in applications to mechanics, but opened the way to other abstract algebras. The remainder of his life contained tragic elements of devotion to quaternions and alcohol. Nevertheless, many of Hamilton's discoveries are fundamental to the study of mechanics, and even quaternions have found applications in physics and computer graphics. The following is one of my favorite stamps. It certainly is a beautiful stamp, but the reason I like it is the way it relates to my research interests. I am an algebraist and most of my research is in the area of noncommutative ring theory. 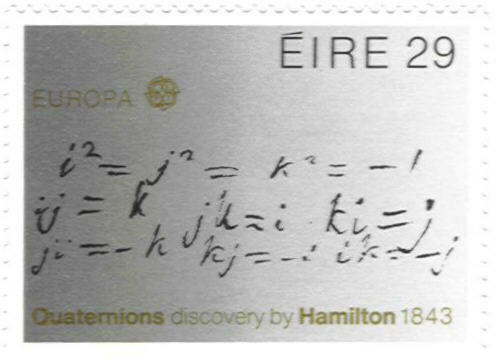 The stamp depics, in Hamilton's own handwriting, the defining relations for the division ring (noncommutative field) of quaternions; division rings are fundamental objects in the theory of noncommutative rings. It is reported that Hamilton was so delighted with his discovery of the quaternions that he carved these equations into a stone block on the Brougham Street Bridge.